Webhooks are available at the "Starter" plan level and above. If your project is enabled for Webhooks they are accessed from the project dropdown. A Webhook is a method of extending TakeShape's build-in functionality, with custom callbacks to third-party services. These third-party services are anything can be reached via a URL. In practice they are pointing at another server or a Function-as-a-Service (FaaS) like AWS Lambda, Google Cloud Functions or Azure Functions. Webhooks - A list of Webhook configurations. You can create as many Webhooks as you need. Resources - Built-in constructs "Assets" and "Sites" and your own project's unique content types for which actions can be configured. Resource selections can be general using * or highly specific and selecting individual sites or content types. 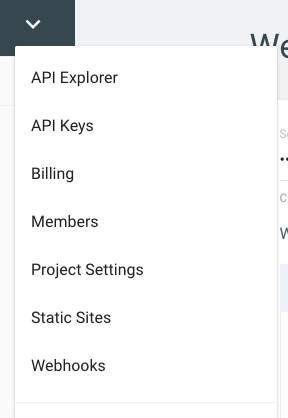 You can configure actions on all sites by using "Site: *"
You can configure actions on all content types by using "Content: *"
Actions available for sites: "Create", "Update", "Delete", "Publish/start" "Publish/success", "Publish/failure". Actions available for content types: "Create", "Update", "Delete". Additional HTTP Headers - Key / Value pairs to be sent along as supplementary headers with the Webhook. These might be used to provide additional context to the receiving service. 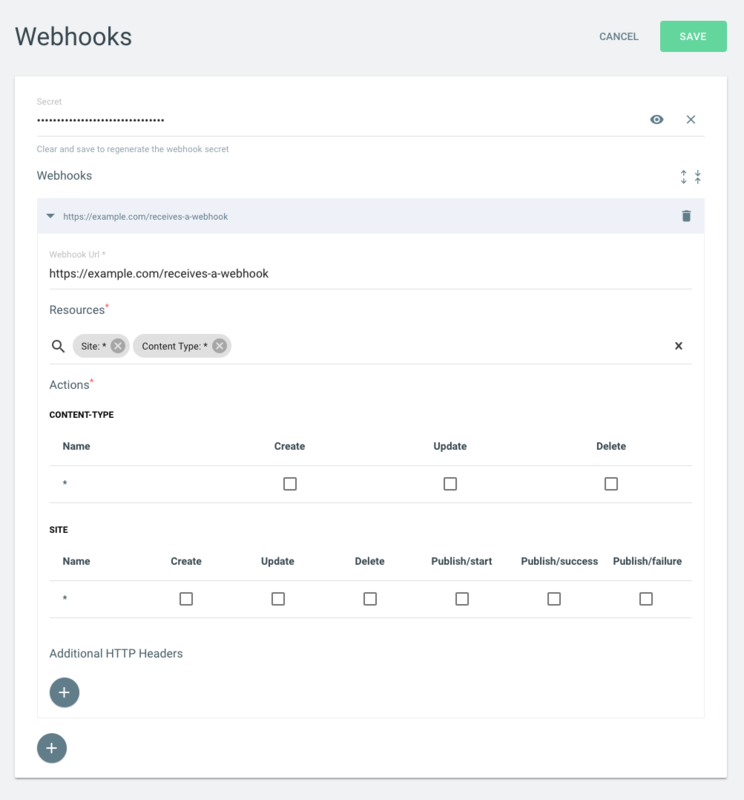 You can use https://webhook.site to test your Webhooks before you build your own service. Below is an example of the Webhook payload that is sent to the configured "Webhook Url". Interested in joining the team as coworker or investor?